Each tablet contains: 20 mg or 40 mg esomeprazole (as magnesium trihydrate). Excipients: Nexium 20 mg: Sucrose 28 mg. Nexium 40 mg: Sucrose 30 mg.
Gastro-resistant tablet A 20 mg: A light pink, oblong, biconvex, film-coated tablet engraved 20 mg on one side and EH on the other side. A 40 mg: A pink, oblong, biconvex, film-coated tablet engraved 40 mg on one side and El on the other side. Healing of gastric ulcers associated with NSAID therapy. administered through a gastric tube. It is important that the appropriateness of the selected syringe and tube is carefully tested. For preparation and administration instructions see section Instructions for use and handling, and disposal (if appropriate). – treatment of erosive reflux esophagitis 40 mg once daily for 4 weeks. An additional 4 weeks treatment is recommended for patients in whom esophagitis has not healed or who have persistent symptoms. – long-term management of patients with healed esophagitis to prevent relapse 20 mg once daily. 20 mg once daily in patients without esophagitis. If symptom control has not been achieved after 4 weeks, the patient should be further investigated. Once symptoms have resolved, subsequent symptom control can be achieved using 20 mg once daily. In adults, an on demand regimen taking 20 mg once daily, when needed, can be used. In NSAID treated patients at risk of developing gastric and duodenal ulcers, subsequent symptom control using an on demand regimen is not recommended. – prevention of relapse of peptic ulcers in patients with Helicobacter pylori associated ulcers. – 20 mg Nexium with 1 g amoxicillin and 500 mg clarithromycin, all twice daily for 7 days. Healing of gastric ulcers associated with NSAID therapy: The usual dose is 20 mg once daily. The treatment duration is 4-8 weeks. Prevention of gastric and duodenal ulcers associated with NSAID therapy in patients at risk: 20 mg once daily. Prolonged treatment after i.v. induced prevention of rebleeding of peptic ulcers. – 40 mg once daily for 4 weeks after Lv. induced prevention of re bleeding of peptic ulcers. The recommended initial dosage is Nexium 40 mg twice daily. The dosage should then be individually adjusted and treatment continued as long as clinically indicated. Based on the clinical data available, the majority of patients can be controlled on doses between 80 to 160 mg esomeprazole daily. With doses above 80 mg daily, the dose should be divided and given twice daily. Nexium should not be used in children younger than 12 years since no data is available. Dose adjustment is not required in patients with impaired renal function. Due to limited experience in patients with severe renal insufficiency, such patients should be treated with caution. (See section Pharmacokinetic Properties). Dose adjustment is not required in patients with mild to moderate liver impairment. For patients with severe liver impairment, a maximum dose of 20 mg Nexium should not be exceeded. (See section Pharmacokinetic Properties). Dose adjustment is not required in the elderly. Known hypersensitivity to esomeprazole, substituted benzimidazoles or any other constituents of the formulation. Esomeprazole should not be used concomitantly with nelfinavir (See section Interaction with other medicinal products and other forms of interaction). In the presence of any alarm symptom (e.g. significant unintentional weight loss, recurrent vomiting, dysphagia, haematemesis or melaena) and when gastric ulcer is suspected or present, malignancy should be excluded, as treatment with Nexium may alleviate symptoms and delay diagnosis. Patients on long-term treatment (particularly those treated for more than a year) should be kept under regular surveillance. Patients on on-demand treatment should be instructed to contact their physician if their symptoms change in character. When prescribing esomeprazole for on demand therapy, the implications for interactions with other pharmaceuticals, due to fluctuating plasma concentrations of esomeprazole should be considered. (See section Interaction with other medicinal products and other forms of interaction). When prescribing esomeprazole for eradication of Helicobacter pylori possible drug interactions for all components in the triple therapy should be considered. Clarithromycin is a potent inhibitor of CYP3A4 and hence contraindications and interactions for clarithromycin should be considered when the triple therapy is used in patients concurrently taking other drugs metabolised via CYP3A4 such as cisapride. This medicinal product contains sucrose. Patients with rare hereditary problems of fructose intolerance, glucose-galactose malabsorption or sucrase-isomaltase insufficiency should not take this medicine. Treatment with proton pump inhibitors may lead to slightly increased risk of gastrointestinal infections such as Salmonella and Campylobacter (see section Pharmacodynamic properties). Co-administration of esomeprazole with atazanavir is not recommended (see section Interaction with other medicinal products and other forms of interaction). If the combination of atazanavir with a proton pump inhibitor is judged unavoidable, close clinical monitoring is recommended in combination with an increase in the dose of atazanavir to 400 mg with 100 mg of ritonavir; esomeprazole 20 mg should not be exceeded. (hypomagnesemia) if taken for prolonged periods of time (in most cases, longer than one year), magnesium supplementation alone did not improve low serum magnesium levels and the PPI had to be discontinued.low serum magnesium levels can result in serious adverse events including muscle spasm (tetany), irregular heartbeat (arrhythmias), and convulsions (seizures); however, patients do not always have these symptoms. Treatment of hypomagnesemia generally requires magnesium supplements. Treatment in patients taking a PPI and who have hypomagnesemia may also require stopping the PP!. The decreased intragastric acidity during treatment with esomeprazole, might increase or decrease the absorption of drugs if the mechanism of absorption is influenced by gastric acidity. In common with the use of other inhibitors of acid secretion or antacids, the absorption of ketoconazole and itraconazole can decrease during treatment with esomeprazole. increased serum levels (80-100%) have been reported during concomitant omeprazole treatment (40 mg qd). Treatment with omeprazole 20 mg qd had no effect on the exposure of darunavir (with concomitant ritonavir) and amprenavir (with concomitant ritonavir). administration with esomeprazole and nelfinavir is contraindicated. 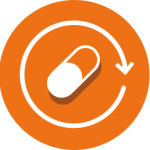 esomeprazole is introduced or withdrawn. Omeprazole (40 mg once daily) increased voriconazole (a CYP2C19 substrate) Cmax and AUC by 15% and 41%, respectively. Concomitant administration of 40 mg esomeprazole to warfarin-treated patients in a clinical trial showed that coagulation times were within the accepted range. However, post-marketing, a few isolated cases of elevated INR of clinical significance have been reported during concomitant treatment. Monitoring is recommended when initiating and ending concomitant esomeprazole treatment during treatment with warfarin or other coumarine derivatives. In healthy VOlunteers, concomitant administration of 40 mg esomeprazole resulted in a 32% increase in area under the plasma concentration-time curve (AUC) and a 31% prolongation of elimination half-life(t1/2) but no significant increase in peak plasma levels of cisapride. rofecoxib did not identify any clinically relevant pharmacokinetic interactions during short- term studies. omeprazole AUC by 280%. A dose adjustment of esomeprazole is not regularly required in either of these situations. However, dose adjustment should be considered in patients with severe hepatic impairment and if long-term treatment is indicated. For Nexium, clinical data on exposed pregnancies are insufficient. With the racemic mixture, omeprazole, data on a larger number of exposed pregnancies from epidemiological studies indicate no malformative nor foetotoxic effect. Animal studies with esomeprazole do not indicate direct or indirect harmful effects with respect to embryonal/foetal development. Animal studies with the racemic mixture do not indicate direct or indirect harmful effects with respect to pregnancy, parturition or postnatal development. Caution should be exercised when prescribing to pregnant women. It is not known whether esomeprazole is excreted in human breast milk. No studies in lactating women have been performed. Therefore Nexium should not be used during breast- feeding. No effects have been observed. The following adverse drug reactions have been identified or suspected in the clinical trials programme for esomeprazole and post-marketing. None was found to be dose-related. The reactions are classified according to frequency (common >1/100, <1/10; uncommon >1/1000, <1/100; rare >111סס00, <111000; very rare <111סס00). Pharmacotherapeutic group: proton pump inhibitor ATC CodecA02B C05 Esomeprazole is the S-isomer of omeprazole and reduces gastric acid secretion through a specific targeted mechanism of action. It is a specific inhibitor of the acid pump in the parietal cell. Both the R- and S-isomer of omeprazole have similar pharmacodynamic activity. Esomeprazole is a weak base and is concentrated and converted to the active form in the highly acidic environment of the secretory canaliculi of the parietal cell, where it inhibits the enzyme H+K+-ATPase – the acid pump and inhibits both basal and stimulated acid secretion. 54% and 24%. Corresponding proportions for esomeprazole 40 mg were 97%, 92% and 56%. Using AUC as a surrogate parameter for plasma concentration, a relationship between inhibition of acid secretion and exposure has been shown. placebo (n=389). Following endoscopic hemostasis, patients received either 80 mg esomeprazole as an intravenous infusion over 30 minutes followed by a continuous infusion of 8 mg per hour or placebo for 72 hours. After the initial 72 hour period. all patients received open-label 40 mg oral Nexium for 27 days for acid suppression. The occurrence of rebleeding within 3 days was 5.9% in the Nexium treated group compared to 10.3% for the placebo group. At 30 days post-treatment, the occurrence of rebleeding in the Nexium treated versus the placebo treated group 7.7% vs. 13.6%. Other effects related to acid inhibition During treatment with anti secretory drugs serum gastrin increases in response to the decreased acid secretion. An increased number of ECl cells possibly related to the increased serum gastrin levels, have been observed in some patients during long term treatment with esomeprazole. During long-term treatment with antisecretory drugs gastric glandular cysts have been reported to occur at a somewhat increased frequency. These changes are a physiological consequence of pronounced inhibition of acid secretion, are benign and appear to be reversible. Esomeprazole is acid labile and is administered orally as enteric-coated granules. In vivo conversion to the R-isomer is negligible. Absorption of esomeprazole is rapid, with peak plasma levels occurring approximately 1-2 hours after dose. The absolute bioavailability is 64% after a single dose of 40 mg and increases to 89% after repeated once-daily administration. For 20 mg esomeprazole the corresponding values are 50% and 68% respectively. The apparent volume of distribution at steady state in healthy subjects is approximately 0.22 Llkg body weight. Esomeprazole is 97% plasma protein bound. Food intake both delays and decreases the absorption of esomeprazole although this has no significant influence on the effect of esomeprazole on intragastric acidity. The area under the plasma concentration-time curve increases with repeated administration of esomeprazole. This increase is dose-dependent and results in a more than dose proportional increase in AUC after repeated administration. This time and dose dependency is due to a decrease of first pass metabolism and systemic clearance probably caused by an inhibition of the CYP2C19 enzyme by esomeprazole and/or its sulphone metabolite. Esomeprazote is completely eliminated from plasma between doses with no tendency for accumulation during once-daily administration. The major metabolites of esomeprazole have no effect on gastric acid secretion. Almost 80% of an oral dose of esomeprazole is excreted as metabolites in the urine, the remainder in the faeces. Less than 1 % of the parent drug is found in urine. increased by about 60%. These findings have no implications for the posology of esomeprazole. The metabolism of esomeprazole is not significantly changed in elderly subjects (71-80 years of age). Following a single dose of 40 mg esomeprazole the mean are under the plasma concentration-time curve is approximately 30% higher in females than in males. No gender difference is seen after repeated once-daily administration. These findings have no implications for the posology of esomeprazole. elimination of the parent compound, the metabolism of esomeprazole is not expected to be changed in patients with impaired renal function. Following repeated dose administration of 20 mg and 40 mg esomeprazole, the total exposure (AUC) and the time to reach maximum ptasma drug concentration (tmax) in 12 tof8 year-olds was similar to that in adults for both esomeprazole doses. 172), magnesium stearate, methacrylic acid ethylacrylate copolymer (1:1) dispersion 30 per cent, cellulose microcrystalline, synthetic paraffin, macrogols, polysorbate 80, crospovidone, sodium stearyl fumarate, sugar spheres (sucrose and maize starch), talc, titanium dioxide (E 171), triethyl citrate. Please refer to expiry date on the outer carton. Do not store above 300 C.
Please refer to the outer carton for pack size. Administration through gastric tube Put the tablet into an appropriate syringe and fill the syringe with approximately 25 mL water and approximately 5 mL air. For some tubes, dispersion in 50 mL water is needed To prevent the pellets from clogging the tube. into the tube. Invert the syringe after injection and shake (the syringe must be held with the tip pointing up to avoid clogging of the tip) Turn the syringe with the tip down and immediately inject another 5 – 10 mL into the tube. Repeat this procedure until the syringe is empty. Fill the syringe with 25 mL of water and 5 mL of air and repeat step 5 if necessary to wash down any sediment left in the syringe. For some tubes, 50 mL water is needed. Nexium is a trade mark of the Astrazeneca group of companies.